The Big Sewickley Creek Volunteer Fire Department provides fire protection and emergency services for the Borough of Bell Acres, Allegheny County, PA. We are a non-profit organization of volunteers that give freely of our time to provide for the safety and welfare of the residents and visitors of the community. In addition to our firefighting duties, our QRS (Quick Response Service) program provides assistance to the Quaker Valley Ambulance Authority in Bell Acres and surrounding communities. Many of our members are also trained, and certified by the state Department of Health, in some level of emergency medicine. We can respond to the emergency and start life saving procedures while the ambulance is enroute. Many of our members are also trained as fire police. They assist with traffic and crowd control at emergencies. Fire safety and fire protection. Fire Police and traffic and crowd control. The Big Sewickley Creek Ladies Auxiliary is made up of women from Bell Acres and surrounding communities. Their function is to provide support for the fire department. 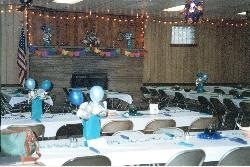 Our social hall is available for rent. Hold your private or public events here.